Missoula – The Jeannette Rankin Peace Center is hosting a series of community dialogues with the 2018 Hubert H. Humphrey Fellows from the University of Montana. The seventeen Fellows are sponsored by the U.S. State Department. They arrived this past April for a four-month intensive English language and cultural program at UM English Language Institute (ELI). 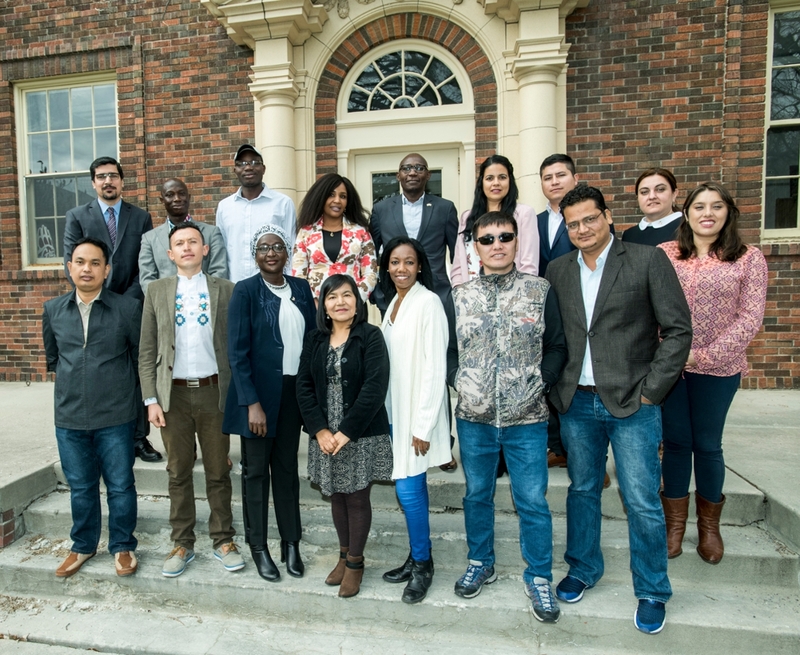 The Humphrey Fellows are mid-career professionals from a variety of fields: finance and banking, human resource management, law and human rights, public policy analysis and public administration, agricultural and rural development, public health, and environmental policy. The home countries of the Humphrey Fellows are as follows: Benin, Burma (Myanmar), Central African Republic, Chile, Colombia, Cuba, Ecuador, Georgia, Iran, Mongolia, Nepal, Niger, Senegal, and Togo. Bortis, along with Jeanie Castillo, are coordinating and overseeing the arrival and stay of the Humphreys at UM. The English Language Institute at the University of Montana serves as a long-term English program in the United States to assist fellows with their transition to the United States and the English language. The Humphrey Fellows will stay for four months at UM and then go on to their academic internships at such prestigious universities as Boston University, UC Davis, Cornell, MIT, Penn State, American University and Emory. In addition to their classroom English, each Humphrey Fellow will be partnered with a UM faculty member who shares their same field of interest. They will also have a community partner who will be a Missoulian ambassador. The Hubert H. Humphrey Fellowship Program, funded by the Department of State and administered by the Institute of International Education, brings young and mid-career professionals from designated countries to the United States for a year of non-degree graduate-level study, leadership development, and professional collaboration with U.S. counterparts. Founded in 1993, ELI serves international students seeking to improve their English language and academic skills in order to pursue studies at UM or another institution of higher education, or for professional training purposes. The institute, housed within UM's Global Engagement Office, provides academic and summer instruction, as well as tailored short-term English language and American culture training programs. ELI has taught English to students from more than 44 countries, with a majority of students continuing their studies at UM or other American institutions. The Jeannette Rankin Peace Center is a non-profit community-run organization founded on the principles of fostering peace through cultural understanding and communication. May 31: Human Rights, Law and Finance – Nino Elbakidze (Georgia), Coumba Ndiaye (Senegal), and Hadiza Gagara Dagah (Niger). June 14: Education and Technology – Zull-Kifuly Moumouni (Benin) and Serge Adouaka-Ngoimale (Central African Republic). June 21: Natural Resources and Agriculture – Hossein Babazadeh (Iran), Tuguldur Enkhtsetseg (Mongolia), and Marlen Navarro (Cuba). June 28: South America – Luisa Marillac Trujillo Cordova (Ecuador), Jenny Urrutia Viveros (Chile), and Jorge Forero Gonzalez (Colombia). July 5: Urban Planning and Human Resources – David Luna (Colombia), Jesus Monreal Carvajal (Mexico), and Yasmira Calderon (Cuba). July 19: Public Health Policy – Nyan Win Myint (Burma/Myanmar), Lal Kunwar (Nepal), and Kokou Alinon (Togo). Admission is free and all events run from 5:30 p.m. to 7 p.m. The Jeannette Rankin Peace Center is located at 519 S. Higgins Avenue in Missoula. Click here to see the biographies of the 2018 Hubert H. Humphrey Fellows at UM. For more information about the Hubert H. Humphrey Fellows call ELI Chair Jeanie Castillo at 406-243-6235 or email jeanie.castillo@umontana.edu.